Product #3138 | SKU H-FS014045 | 0.0 (no ratings yet) Thanks for your rating! 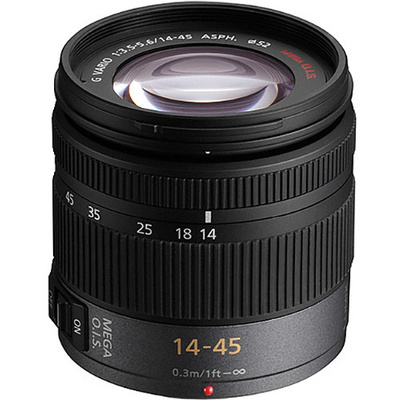 A versatile zoom spanning wide-angle to portrait-length perspectives, the Lumix G Vario 14-45mm f/3.5-5.6 ASPH. MEGA O.I.S. from Panasonic is a 28-90mm equivalent lens for Micro Four Thirds mirrorless cameras. Well-suited for most general shooting applications, this lens employs one aspherical element to help reduce the overall size and weight of the lens, and this element also works to control distortion and spherical aberrations throughout the zoom range for improved sharpness. Individual elements have also been multi-coated to suppress lens flare and ghosting for greater contrast and colour accuracy in a variety of lighting conditions. Additionally, a MEGA O.I.S. system is featured, which compensates for camera shake to better enable shooting handheld in low-light environments. Standard zoom is designed for Micro Four Thirds mirrorless cameras and provides a 28-90mm equivalent focal length range. One aspherical element controls spherical aberrations and distortion throughout the zoom range for improved sharpness and more accurate rendering. MEGA Optical Image Stabiliser minimises the appearance of camera shake to benefit handheld shooting in difficult lighting conditions.